The students of #GG3161 "Atmospheres: Nature, Culture, Politics" in Royal Holloway, University of London's Geography department will participate in a double Aerocene Explorer launch on Wednesday the 7th February between 11am and 1pm. Following winds, weather and atmospheric forces, the Explorer uses no other resource than the sun to lift off ground and float around the sky. Maintained by practices of fabrication, inflation and tracking, an Aerocene Explorer launch is made to happen through collaboration and team-work. The launch will be at the Eastfield Grass Pitch next to Gower and Wedderburn Halls at the main university campus. Please see the highlighted area of the map below. 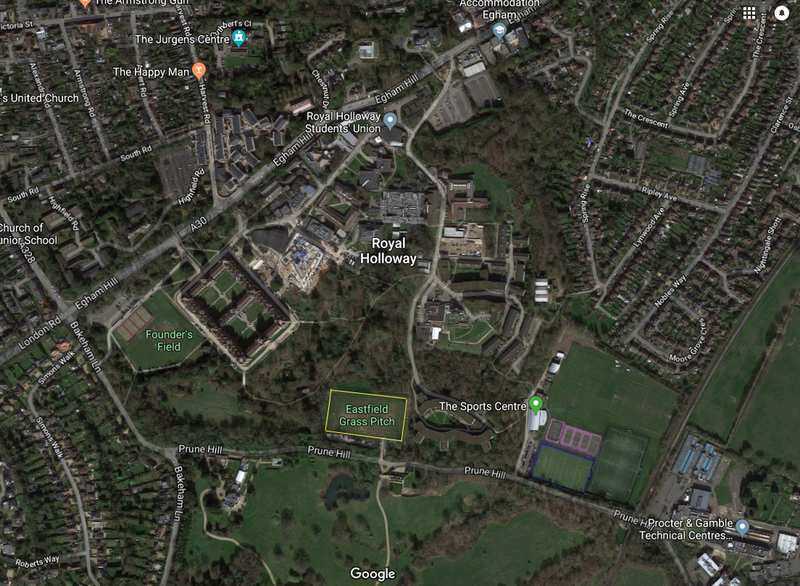 Royal Holloway University is in Egham. From London, trains departing from Waterloo in the direction of Richmond run through Clapham Junction and arrive at Egham station in approximately 30 minutes. From the station in Egham, the walk to the university campus is approximately 15 minutes. We welcome everyone to join but would like to ask you to please get in touch with GG3161 course leader Sasha Engelmann beforehand (sasha.engelmann@rhul.ac.uk, 07833367353). She will be able to take you through and guide you to the right place.